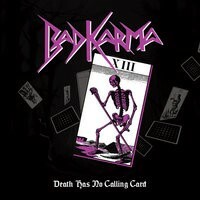 BAD KARMA was a thrash metal band that formed in the 80’s but disbanded before they became well known. However, this release is actually three demos finally collected onto one disc. Its a shame that this band never really took off or became well known because I found myself really enjoying this ripping thrash metal. Alec Dowie has an amazing vocal attack and he reminds me so much of a young James Hetfield circa “Ride The Lighting” and “Master of Pupplets.” Musically, they aren’t as filled with much neo classical themes or finesse as METALLICA , but the best thrash is dark and gritty. Their vibe is obviously old school but the playing is more mature than most of the other early thrash debuts of that time. The title track is classic thrash with a throat wail throwing out the lyrics…heavy, well-toned guitar riffs and a great rhythm section found in the bass and drums. As with most thrash from this era, the lead guitar gets to be in the forefront and this song, among all the others, features some really slick and catchy guitar solos that ride the balance between thrash and epic. I swear the solo on the title track could had been a lost one from “RIDE THE LIGHTING” in terms of its feel and sound, although, thankfully, the wah-wah pedal doesn’t rear its ugly head too much. Sometimes the band does a complete change in the middle of the song that really shocks me; a great example of this is track six, “Unsane,” when it suddenly goes from thrash to some sort of atmospheric instrumental section that borders on early prog. Dana Guiod’s bass really shines on this section. “The Final Chapter,” features a nice clean intro and some interesting dual guitar parts showcasing the bands ability to mix thrash with occasional doses of melody, much like KREATOR is known for. Anyone who loves thrash, especially from its glory days in the 80’s, and wants to step outside the Big Four and other more known bands, could do a lot worse than this collection of well-done demos.